MAUREEN is a sartorial conception that focuses its attention on a unique garment, the coat, poetic vision of a piece of clothing that is a place to live, a second skin that predisposes us to interact with others by accompanying us on the impervious journey of life. 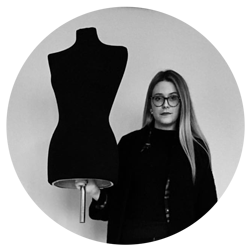 Its founder and designer, Maureen Fachinetti, is a European talent that gained experience in the field of fashion by immersing herself in the stylistic environments of Dior, Hugo Boss, Myriam Schaefer and others in the top cities of the European fashion scene, Milan, Paris and London. In 2015 the brand took its very first steps and needed a logo. The brief described a simple presentation of the name with the M transformed to stand out and become a graphic element of its own, to be embroidered on the products’ sleeves. Below is a selection of the proposals and how they developed into the final design. The first round of proposals focused on the M and its variations. The second round was focused on testing fonts matching a first selection of M the client chose. The next step was to decide if the M would be presented in an enclosing shape with the name separated, or if it would be the initial to the full name. Finally we introduced color. The client was already set on the use of bordeaux, salmon and/or marsala, so I simply played with pairing variations. The last round of revisions reduced the choice to two M designs and three color variations, while only playing with one font and its bolded version. As you can see from the final result below, the client chose the bi-color with Marsala but paired with a pink hue instead of the original “salmon”. Additionally, two last minute changes were made: the M’s edges were rounded and her last name was added below in a lighter font weight. The final result, applied to the designer’s labels.